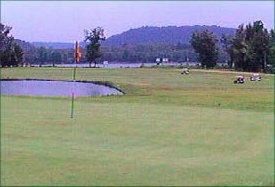 This 18-hole layout borders the Tennessee River and is built on very hilly terrain. Total yardage=6,400 (ladies 5,000); Bent Grass Greens, Bermuda Fairways. Driving range, full line golf shop on site. Golf Instructions by a PGA Professional. USGA rating 70.4, slope rating 123. Open daily daylight to dark.